Neurolinguistic Programming or NLP training in Newcastle upon Tyne is a course of learning in personal and professional development where you can learn how to enrich your life. NLP Practitioner training in Newcastle is very easily accessible from Durham, Darlington, Sunderland and the Northumberland region. The next 18 day NLP Training begins in January 2013 and is three days per month until June. The human brain has been described as the most complex piece of software on the planet that comes without a user manual. Learning how your brain works and how you can, with practice, re-program your own learned patterns and behaviours gives you a genuine way to a happier, healthier and discover and create a more meaningful life for yourself. Your brain and nervous system, from an evolutionary perspective, is for your survival and passing on of your genes. From a more personal perspective, your brain, is an organism that is more than capable of making you feel happy, content and open to connecting with others. Sometimes it can literally feel as is your brain is working against you and an internal saboteur is scuppering all your good intentions and plans. Through a series of structured exercises, demonstrations and reflective feedback sessions, you will gain a deep knowledge of the application of NLP that you can apply in your personal and professional life to do these more affectively. We all live in a universe that on the grand scale seems deterministic. Our reality is more like that our life is packed full of surprises and what has been described as chaos or chaotic systems. The more sense we have of feeling in control or at cause in our life’s generally equates to the less problematic stress we experience. How we respond to our environment, how we respond to major stressors and even how we talk to ourselves sets up either a healthy or unhealthy psychological immune system to the psychological viruses that are prevalent today. Your life will never really be free of major stressors, major life changes or the uncertainty of being human. What you can change, often with massive positive results, is how you respond. The simplest way to be engaging and as such engage others with your ideas is two fold: First having a deep appreciation of your own values is essential in being congruent in your own communication. Your values are at the core of your actions and behaviours. If you were asked to write down your ten most important values could you? Values are the kinds of experience and actions we place huge importance on. When you understand your values you know why you do things. Secondly, being able to communicate authentically and with passion, offers you the platform, to influence with real integrity. You can communicate the deeper purpose and benefits of your ideas and plans so that you can reach others and share your values in ways that can be more wholly grasped, seen and understood by others. Not every one will want to get on board, but you will be more able to reach the people who share your passions. NLP Practitioner in Newcastle is easily accessible from Sunderland | Darlington | Durham and the NorthEast of England. NLP Practitioner Training takes place in Jesmond Dene Conference Centre which is located in the very picturesque Jesmond Dene valley in Newcastle upon Tyne. Next 18 day NLP Training begins January 2014 and completes in June 2014. Please call 0770 481 8467 or email nigel@communicatingexcellence.com for additional details. 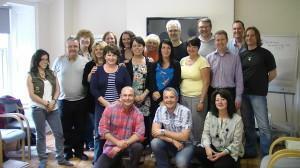 Next 9 day NLP Practitioner Training April 2013 Newcastle upon Tyne. This entry was posted in NLP Business, NLP Practitioner Darlington, NLP Practitioner Durham, NLP Practitioner Jesmond, NLP Practitioner Morpeth, NLP Practitioner Newcastle, NLP Practitioner North East, NLP Practitioner Sunderland, NLP Practitioner Teesside, NLP Practitioner Training, NLP Practitioner Tyneside. Bookmark the permalink.